BrewNymph®: Do You Know Your Boot from Your Maß ("mass")? It's Oktoberfest time! Do You Know Your Boot from Your Maß ("mass")? It's Oktoberfest time! There's probably no more festive time of year in the beer world than OKTOBERFEST! The original German Oktoberfest happens each year in Munich during the last two weeks of September through the first weekend of October, and is host to approximately 6 million fest-goers each year. If you aren't one of those attending the "Wiesn" (German for "meadow") this year, don't get your shorts all in a bunch. We also celebrate it here in the U.S. So, grab your lederhosen and dirndls because everyone's German during Oktoberfest! The Oktoberfest celebration isn't just about the beer (well, maybe it is). It's an integral part of German history, and we have Bavaria's King Maximilian Joseph to thank for it. Back in 1810, the King threw a two-day festival in celebration of the wedding of his son, Crown Prince Ludwig, to Princess Therese. The event offered free beer and free food at several Munich locations, along with a horse race at a racing ground which later became known as Theresienwiese. And, behold, a tradition was born! To this day, the mayor of Munich taps the first keg at noon on the first day of Oktoberfest along with the proclamation "O'zapft is!" ("it is tapped"), and the revelry begins. Now, what about that beer? Alongside all of that pumpkin beer that started invading the shelves seemingly on the last boom of the 4th of July fireworks finale, you're sure to see the "Oktoberfest" or "Octoberfest" beers, also generally described as "Märzen" or "Festbier." The name "Oktoberfest" is an appellation in Germany, and under the applicable laws of Germany and the EU, only those beers brewed by the large breweries within the Munich city limits can be served at the Oktoberfest and are allowed to use the name "Oktoberfest" for the beer (Augustinerbräu München, Hacker-Pschorr, Hofbräu, Löwenbräu, Paulaner, and Spaten-Franziskaner-Bräu). Prost! Traditional lager in a Maß. Yeah, that's a lot of beer. While the styles of Märzen and Oktoberfest (lagers) have, in the past, largely been deemed the same under the style guidelines, the new BJCP (Beer Judge Certification Program) Guidelines of 2015 (released earlier this year) distinguish the two. Typically, an Oktoberfest/Märzen is considered malty, sweet and amber-to light brown in color. Over the years, however, the German Oktoberfest renditions have taken on a lighter, more golden color, mostly in response to consumer sentiment and the movement toward a "lighter, more drinkable" version (or, more "poundable," according to the comments by the Paulaner brewer in the BJCP guidelines). So, now, as far as official BJCP "styles" go, and in recognition of the protected Oktoberfest name in Germany, the "Festbier" is the golden version with a strong malty flavor alongside a lightly toasty and softly sweet character. The "Märzen" is the amber-to-light brown type, also with a malty sweetness and rich, toasty, bready flavor. The ABV and IBUs are roughly the same (5.8-6.3% and 18-24/25, respectively). The US-brewed "Oktoberfest" types are generally in the Märzen style. Beware of that toe, though! And, in case you were wondering about the English-Metric conversions, one liter is just a bit over a quart (which is 32 oz., or 2- 16 oz. pints). These are some of my favorite styles of beer, and I am definitely looking forward to attending some Oktoberfest celebrations. I don't know about you, but I've already had a few of the Oktoberfest/Festbier/Marzen beers from both German and American brewers (wait too long, or they'll be gone). 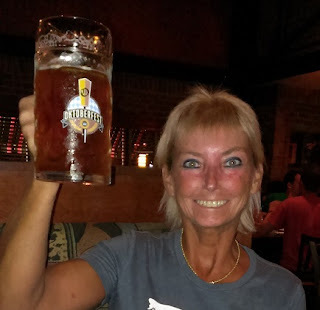 Which brings me to Oktoberfest in Florida! Like I said, to do this right, you need to get in the spirit of things, so make sure your wardrobe includes some lederhosen, a dirndl, some golden braided hair, or at least an Oktoberfest Bavarian Alpine hat! OKTOBERFEST at New Smyrna Beach Brewing Company, 9/19, New Smyrna Beach,starting at 1pm. It's gonna be a big ol' party! New Oktoberfest lager, the Beachtoberfest, 5.5 ABV, 26 IBU. 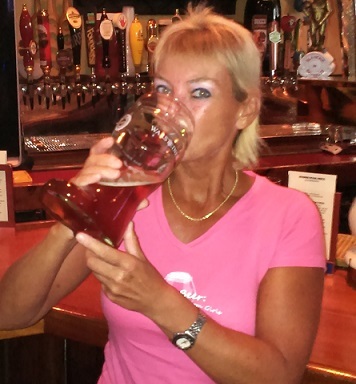 Half-liter Oktoberfest mugs with special pricing on beer! Check out this brewery if you haven't been there yet, you'll be glad you did -- see my blog post here. I always love visiting here! And, psst -- they're fun, and they make some really good beer! 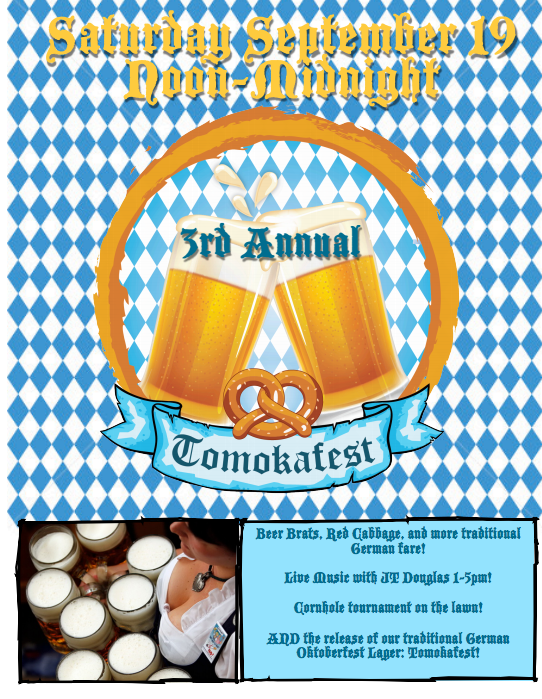 OKTOBERFEST at Ormond Brewing, 9/25, Ormond Beach. Releasing the Oktoberfest beer, 5.5 ABV, 25 IBU, with party and food. More info on the way! Plus, you'll love the friendly environment here, including an inside bar and outside deck/patio! 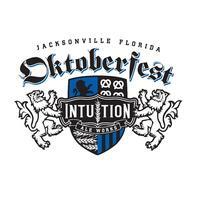 Oktoberfest at Intuition Ale Works, 10/3, 1-9pm, Jacksonville. Tapping of Oktoberfest and Kolsch beers. Oompah music by the Swinging Bavarians. All-you-can-eat German food, Cinotti's pretzels, beer games. 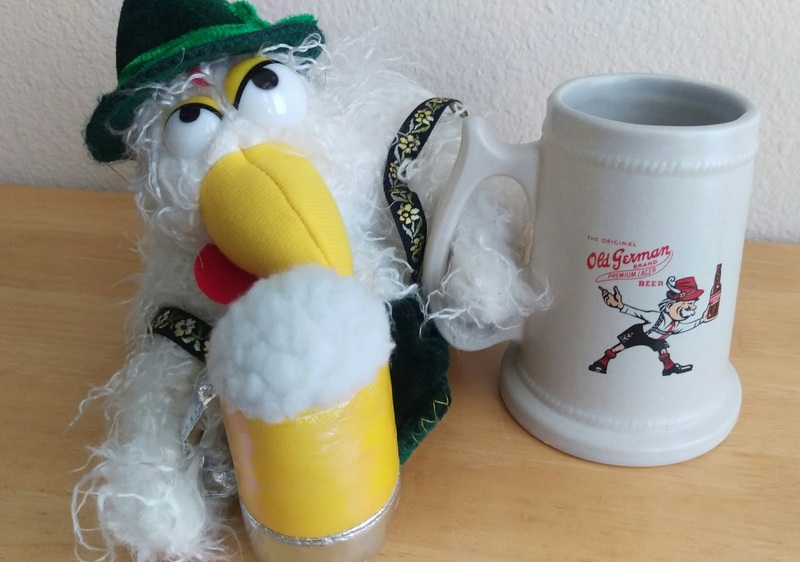 Souvenir stein. 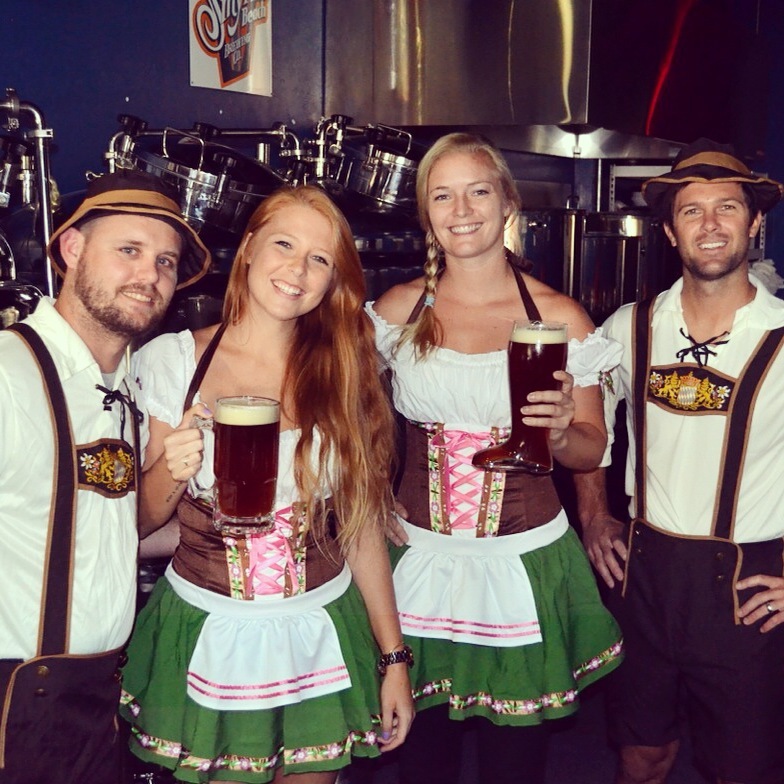 Dress in Oktoberfest attire for a free beer! Naming of King and Queen of Oktoberfest. Stein-holding competition. Got lederhosen and dirndls? Get tickets here. 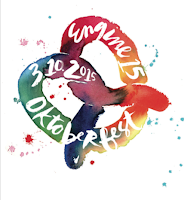 OKTOBERFEST at Engine 15 Brewing Company, 10/3, all day, Jacksonville Beach. Well, I went to this one last year (see photo above), and I expect more of the same craziness and Gemütlichkeit this time around. 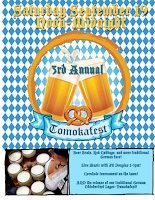 Oompah band 2-4:30pm, Mark O'Quinn 5-7pm, feats of strength, chicken sh*t bingo, King & Queen, ginormous pretzels. New this year: limited edition one-liter ceramic beer mugs. And, a new Oktoberfest beer to (das) boot -- tapped at party. Jawohl, Damen und Herren! OKTOBERFEST at Green Room Brewing, 10/3, Jacksonville Beach. New Oktoberfest beer! Special bottle release. More info on the way! 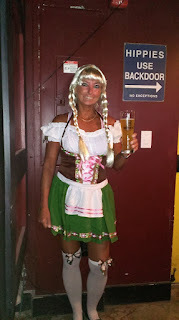 OKTOBERFEST at Playalinda Brewing Company, 10/10, Titusville. Tapping the Oktoberfest beer at noon: coming in at 6 ABV. Oktoberfest party with traditional German food. You need to check this place out! In fact, you can read about my visit shortly after they opened late last fall here. BUT, WAIT, there's MORE OKTOBERFEST! If you're in the Jacksonville area, there are various Oktoberfest beerfest events on the calendar in September and October. Check out my BeerSphere page for more on those! I also included OKTOBERFEST TAMPA, because I know that there will be quite a few JACKSONVILLE JAGUARS® fans (ahem, Bold City Brigade) in Tampa during the weekend of October 9-11 for the Jags-Bucs game (including me! ).